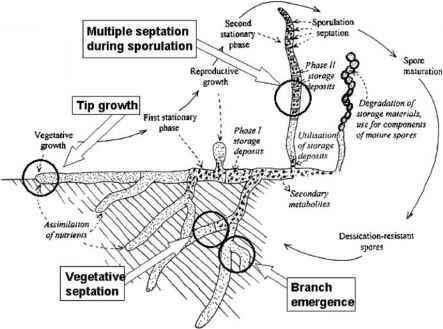 The earliest finding on the possible strategy utilized by R. fascians to alter plant development was the notion that some bacterial strains were able to degrade auxin (Lacey 1948). The opinion was that a decreased auxin concentration in the infected tissues would shift the auxin/cytokinin balance in favor of shoot formation (Kemp 1978). However, more recent studies of the phe-notype of infected plants have revealed that auxin might play an important role in symptom development (Vereecke et al. 2000). Analysis of secreted indole compounds has indeed demonstrated that R. fascians strain D188 carries auxin biosynthetic genes on its chromosome. Although the indole-3-acetic acid (iaa) genes have not been identified yet, biochemical analyses show that the kinetics of auxin biosynthesis are controlled by pFiD188 (Vandeputte et al. 2005). Based on the available data, a dual role for auxin during the interaction is postulated, first as colonization factor and subsequently as a virulence determinant. Persistent survival inside the plant tissues, required for maintenance of the leafy gall structure, necessitates the alteration of the bacterial metabolism. The expression of a malate synthase gene vicA, located in the vic (virulence on the chromosome) locus, is upregulated in the presence of plant extracts and controlled by the linear plasmid. Malate synthase functions in the gly-oxylate shunt of the Krebs cycle and catalyzes the condensation of acetyl coenzyme A and glyoxylate to form malate. Together with isocitrate lyase, it circumvents the loss of two carbons during the tricarboxylic acid cycle, when the bacterium grows on C2 compounds as the sole carbon source. The functionality of the vic locus is imperative for endophytic survival, because mutations render the bacteria unable to grow on the nutrients available inside the plant, with a diminished virulence as a result (Vereecke et al. 2002a,b). The above data show that although the main virulence determinants are encoded by the linear plasmid pFiD188, the chromosome plays an important role in the adaptation to the epiphytic and endophytic lifestyle. All aspects of the infection process require fine-tuned expression of key genes, which is accomplished by the interplay of regulatory proteins and compounds encoded both by the chromosome and the linear plasmid, allowing the integration of a wide range of signals and an equilibration of the interaction. The distribution of virulence-associated genes over chromosome and plas-mid occurs in other phytopathogens as well. In Clavibacter michiganensis subspecies michiganensis, for instance, the genes directly responsible for induction of disease in host plants are located on two transmissible circular plasmids, pCM1 and pCM2. Full virulence is only observed when both plasmids are present. However, genes required for the other aspects of the plant-microbe interaction, such as host recognition, infection, suppression of host defense, and effective colonization, map on the chromosome (Meletzus et al. 1993; Gartemann et al. 2003). Similarly, in Agrobacterium tumefaciens, the tumor-inducing plasmid carries the main virulence machinery. Nevertheless, the very first step of the interaction with the host, chemotaxis, is accomplished by the cooperation of both plasmid- and chromosome-borne proteins. Moreover, attachment to the host cell, a vital step in pathogenicity, is also mediated by multiple chromosomal gene products (McCullen and Binns 2006). These observations underline the fact that pathogenicity acquired by plasmids is a novel adaptive trait that broadens the ecological niche of soil-borne organisms.